to properly measure corrosive chemicals. transfer of highly corrosive liquids from your storage container to a mixing tank or process line. • Memory - Save up to 7 preset volumes in the Automatic Batch memory or change each batch in the Manual Batch setting. • Efficient - system operates up to 25 gpm. 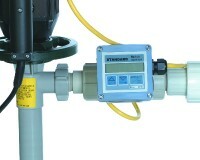 Faster transfer and measurement of liquid increases productivity and lowers downtime. • Quick connection - 1" hose barb or 1" NPT thread for ease in hose change or quick disconnect setup. SERFILCO Smart Pumps are engineered to control, measure and dispense any volume of liquid from drums, IBCs, tanks and any large storage vessel. They can be used in any industry where batching, chemical packaging or dilution is required to be accurate and efficient. Displays volume units in gallons, Imperial gallons, liters, milliliters or cubic meters. Displays flow rate in gallons, Imperial gallons, liters, milliliters or cubic meters per minute, second, or hour. Language can be displayed in English, German, French, Italian or Spanish, as desired. Available in PP or PVDF for complete chemical compatibility. - large storage vessels - 72" (1600 mm). 6. Batch Controller operates on 120V or 220V power. 7. Smart Motors are available in TEFC or ODP for any corrosive environment. Both 60 Hz and 50 Hz motors are available.